Keith was overjoyed. He, a recovering addict with an arrest record, passed the enlistment process to be a culinary specialist with the United States Army. Two days before he was scheduled to leave for basic training, a car struck his bicycle. The driver fled the scene, leaving Keith with a fractured skull, a broken leg and a number of non-fatal injuries. His army career was over before it started and without a clear vision during his difficult recovery, Keith’s drug habit resurfaced. 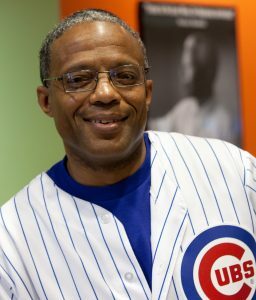 The U.S. Armed Forces offered him the guidance, educational opportunities, and structure that he never received growing up in the urbanized and segregated Westside community of Chicago. Six years later, Keith ran into his longtime friend Antione who he had pressured into drugs in adolescence. However, during this chance reunion Antione welcomed him into a burgeoning ministry called Christian Assembly Outreach. “I introduced him to crack and he introduced me to Christ,” Keith recalled. He felt a renewed sense of hope and championed the ministry’s mission as choir director, kitchen supervisor, building-wide manager, youth mentor, and fundraiser. After five tireless years of service, Keith’s strength and resolve began to teeter. “I.Was.Worn.Out,” Keith said, pausing for emphasis. His eventual fall from grace was lonely and humiliating. I chose a life on the streets. I slept in abandoned buildings that were ridden with feces, urine, trash, and rats and roaches; I slept under people’s porches, under bridges, and out in the woods. I hadn’t showered, shaved, or bathed. And I hadn’t looked in the mirror, or wanted to see my reflection. During the next eleven years, Keith accumulated 52 retail theft arrests and 4 prison stays in an attempt to support his habit. His record caught up to him and Keith was sent to the Southwestern Correctional Facility in East St. Louis. His positivity earned him the trust of staff members and the responsibility of facilitating a 30-day orientation for incoming prisoners. Keith gained a newfound sense of self-efficacy through his ability to affect the experiences of others caught in destructive cycles of violence, addiction and co-occurring disorders. And on the day before he was discharged, Keith received his General Education Development (GED) Certificate. From that point on, he adopted a “no-quit attitude” and pursued rehabilitation programs to get his life on track. I learned about changing the way that I think and my behavior and I got to see the part that I played in everything that happened to me in my life. Today I still live by that rule of holding myself accountable for my actions. As a new resident of Seattle and an even newer Member at Recovery Café, Keith has already made a palpable impact on our community by regularly sharing his inspirational story during Pathways to Recovery. He is a counselor for King County’s 180 Program, designed to keep youth out of the criminal justice system. He’s also gained steady employment and purchased a new car, aptly colored Seahawks green, with the help of a timely referral from our staff. Recovery Café is proud to welcome Keith to our loving community. He is an instrument of love and hope in the lives of others.